I have added to this chapter a drawing I made this summer (2009) after I had found the mathematical relation between the megalithic ell (ME) and the megalithic yard (MY). 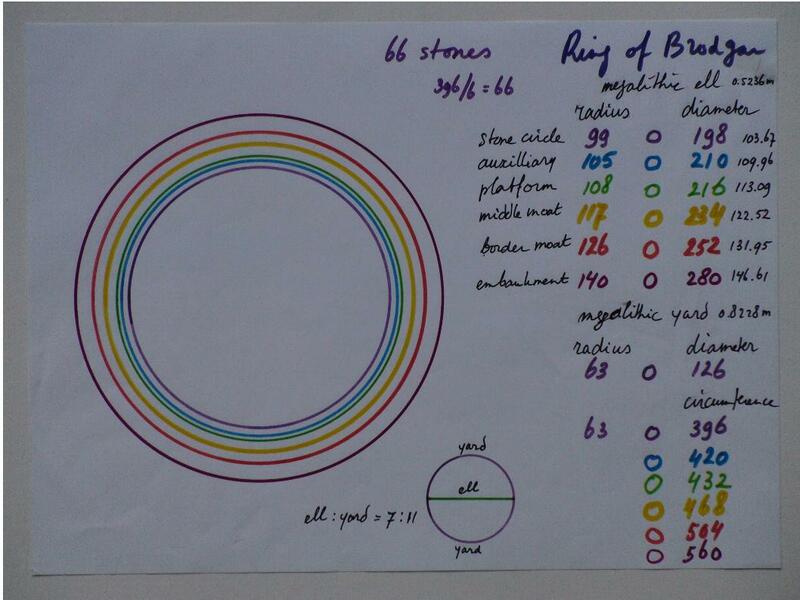 On the basis of this mathematics I concluded that there is a possibility that the ring would have 66 stones because of 396 MY /6 is 66, which would relate to the 11 stones eventually erected at Stenness ( not 12, although the spacing is for 12). Also 63 would fit the model as the number of the radius in MY. The number of stones, though, is not necessarily related to the maths of the ring ratios as we see at Stenness. I would add here now (2013) that I have totally disregarded the possibility of solar and lunar alignments, which is a weakness, but on the other hand it could still be that only certain stones in the circle had significant aligments (that they would all have one is unthinkable) and that the gaps between them had to be filled with stones so as to come to the correct overall number of stones they wanted to get placed. These are three short notes and a picture on the geometry of the ‘rings’ of Brodgar, which I gave to Colin Richards and Jane Downes as leaders of the 2008 Brodgar dig, and to a few others. The originals were handwritten copies (with a few irritating mistakes) and a coloured pictogram in a carton tube. My ideas have become much more specific now, but because this is a first document on the ratios of Brodgar it deserves a place on the site and is, with the corrections given, still broadly valid. The present plan is changed as regards the middle of the moat and especially as regards the radius of its outer perimeter; it changed from 125 to 126 Megalithic Ell. This is a crucial change, because it brings in the number 126, which is 9 x 14, two pivotal numbers in the natural number logic, it sustains the proof of the megalithic yard, as will be shown elsewhere. Because I did not give a specific unit of length at the time, it is a bit of a cryptic piece, but the unit used is the Megalithic Ell of 52.36 cm, which is very close to the Egyptian Royal Cubit, and based on twice the ulna bone (26.18 cm) of the male fore arm (1.73m, 5ft8) , whereas the Egyptian unit was based on the fore arm plus hand as it is depicted in the hieroglyph, (6 palms), with 1/6 part (1 palm) added later, to become the Royal Cubit (52.375cm) of 7 palms. Unfortunately it is all done in a hurry, with an inadequate and outdated picture and not very clear, but the idea still stands and I have much more convincing circumstantial and mathematical evidence now. I can add that according to my model the ring would have had 66 stones, 63 is also a possible key, but there is no necessary relation between the number of stones and the geometry of the rings; at least at Stenness I cannot find a relation between the 11 or 12 stones and the ratios of the circles involved, as yet. So 60 is also still very welcome. In this tube you will find a coloured drawing of the rings that would be involved in the design of Brodgar. The mathematical system is based on whole numbers and seeks to eliminate the irrationality of the diagonal and side lengths of a square. The postulate is that the mathematical parameter of the circle was either a radius of 99 or one of 140, depending on the unit of length that was chosen. Like the Egyptians they had two units of length which stood in ratio of 1 to square root 2. By doing this they were capable of expressing side and diagonal of a square in whole numbers. This is the principle of the Great Pyramid. The important point is that the very construction of big circles confronted them with the questions of ratios and of course they found, after trying first 3, 4, 5 and 6, that when you divided a diameter by 7 you got a unit length that fitted exactly 11 times in the half circle, and that this was always the case. This knowledge made the numbers 7 and 11 special, they, no doubt had names for these, but names for numbers over 20 it becomes doubtful. With no adequate symbols to denote these calculations, to make stone circles and to space stones, one has to do arithmetic and they did, but, as Plato already assumed, mathematics originates with astronomy. It was indeed the charting of the night sky and the precision of the calendar, which, from a plain necessity to predict the ocean tides for fishing and the right times of the agricultural cycle, became an end in itself. Science for its own sake was born and mathematics was its tool and proof. This was the spirit in which the stone circles were built to provide a network of calculators which checked and double checked each others counting, so as to keep track of the cycle of the moon. The big cycle takes 56 years, so it needs some organisation to keep count over what were generations in those days. So, if one is fond of ceremonies, there is a lot of ritual involved in keeping count of the days of the years, the lunar cycle and what more they followed and calculated. But one can understand that when such an intense interest in cosmology is widespread and the subtle energies of the earth are aroused for healing and for influencing the atmosphere, that in such a culture there is absolutely no difference between the secular and the sacred, it must have been a profoundly spiritual society. Assuming that the geometry of the circle was indeed such that the diameter was 198 units, then what would the spacing be, given a certain amount of stones? At the Stones of Stenness we see a very well executed spacing which makes it all the more peculiar that it seems one place was left open. At the Ring of Brodgar we assume that 60 stones were intended, but it is also possible that 59 were placed, but also 61. Both numbers have cosmological significance but 61 only as 6 x 61 = 366, so to count the years and leap years in cycles of 6 x 61(-1) ; 59 is the number of two lunar cycles and would indicate a strong lunar emphasis on the circle, the number 60 though would turn it into something really mathematical and it would show an acquaintance with the sexagesimal (60-number)system. This is what I hope will once be conclusively determined because much of my ideas are based on the assumption that they used the 60-number system, although only in terms of its practical superiority, not to build numbers. If then we construct a circle with diameter 198, what then would be its circumference? Here we use the 22/7 and 198 x 22/7 =622.2. This then is the perimeter which should hold the 60 stones. When we divide the 622.2 units by 60 we get 10.37, so 3 x 10.37 = 31.11. This though may have been preceded by a calculation with the auxiliary circle of 105 units which produces 2 x 105 x 22/7, 660 units, this now divided by 60 gives exactly 11 units. It is peculiar that it is just this 11 units lengths which occurs as the spacing between the large stones which occupy much of the south western quadrant. It is the lowest part of the circle that has become crowded by stones in closer proximity because maybe they made a mistake in using the measure of the auxiliary circle for a smaller circle, it seems though that the spacing of 11 = + 5.75 m is deliberate and concerns large stones. If the spacing was intended to be equal they would have had 3 stones in 31 units of length which means 10+10+11 spacing. This is obviously not the case, but then there are the large number of stones spaced 8 units = 4.19 (+ 420), so this makes good on the “over-spacing” of the big ones, and crowding of the small ones. = + 3.15 m, the next is 7 units, 8 units etc. I am confident you will find these values as well.